Happy New Year Y&R fans! I hope 2014 brings you happiness and health. I also hope it's a better year for The Young and the Restless. 2013 was not exactly a banner year for our favourite soap, even though it celebrated its 40th anniversary on the air. The death of Jeanne Cooper, whose Katherine Chancellor character was a mainstay on the program, and the departures of Michelle Stafford (Phyllis), Billy Miller (Billy Abbott) and Michael Muhney (Adam Newman), all contributed to a difficult year for the show. There is, however, hope for 2014. 1. The return of Tristan Rogers as Colin Atkinson should spice things up and provide a much-needed boost to Jess Walton's (Jill) storyline. A decision will have to be made about the status of Phyllis. After all, the writers can't keep her in a coma forever. I strongly doubt that Phyllis is going to die because there have been too many sad happenings on the show of late. My guess is that they are leaving the role open as long as possible in the event that Michelle Stafford will change her mind and return. They can only wait so long, though. At some point, if Michelle doesn't show any inclination to come back, she will have to be replaced. Regular readers of Y&R Report know that I want Eileen Davidson to return full-time as Ashley Abbott. In October, soap writer Daniel J. Kroll stated that "Davidson has expressed her desire to take some time off from regular, contract work on a soap." After a rest, however, Eileen may decide to go back to a regular role as Ashley. This week, while home to celebrate the New Year, Ashley crossed paths with Dr. Stitch again. The chemistry between those two is palpable. It's definitely there. A great storyline is just sitting there waiting for you, Eileen Davidson. Don't let it pass you by. Speaking of chemistry, I think that the couples who have the most chemistry on the show are Victoria and Billy and Chelsea and Adam. It just won't be the same when Billy Miller and Michael Muhney leave their roles. Although Miller's being replaced by David Tom, who has played the role of Billy before, I doubt that his chemistry with Amelia Heinle (Victoria) will be as good. The same goes for Chelsea and Adam. We don't even know who will replace Michael in the part of Adam yet. Frankly, I'd rather have the character written out of the show than have the role recast. 2. 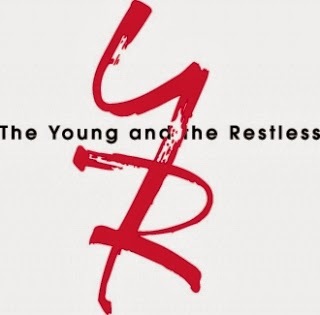 Billy J. Miller recently spoke out about leaving Y&R. He stated that the reason for his departure is that the show was not willing to allow him time to pursue projects outside of daytime television.. Miller told Soap Opera Digest that, he was given a generous offer to remain with the soap. ""To pass was the hardest thing I’ve ever done," he declared.. "I was caught between a rock and a hard place. In the past, we were able to venture out of the Y&R world; now it seems there is no longer that flexibility for me." There you have it. According to Miller, it wasn't a matter of dollars and cents. It was a matter of flexibility. If that's the case, then I have to ask why Y&R was so reluctant to let him pursue outside projects. I can certainly understand why a skilled actor such as Billy J. Miller would want to expand his horizons. I can also appreciate why he would not want to be typecast and known only for his portrayal of Billy Abbott. Therefore, I have to question the show's decision to prohibit him from taking on other roles. Isn't that a price worth paying in order to keep a popular and talented actor on board? 3. So fans, we now know that Alex Chavez is "Zach." It seems that Courtney might not be so bad after all. She could be working undercover to help the police infiltrate a drug ring. Perhaps Womack, who could be Courtney's dad, is the leader of the operation. Is she assisting the police in bringing down her own father? 4. In my previous Y&R Report, I predicted that Kelly Andrews was Dr. Stitch's wife. It seems I was wrong about that. I was, however, correct that they are connected in some way and that they know each other. Could Stitch be Kelly's brother-in-law, the uncle of her dead son, Sam? They finally appeared in a scene together for the first time and they are obviously uncomfortable with each other. Kelly was antagonistic towards Stitch and very sarcastic. She obviously blames him for something major. Most likely, he had some involvement in the death of her son. It could be that he performed surgery on Sam and failed to save his life or accidentally contributed to his death in some way. Medical error? Dr. Stitch also admitted that he and his wife are separated. Will she eventually show up in Genoa City? Could Stitch's estranged wife be Kelly's sister? 5. Please! Not another stalker storyline! Tyler's former finace, the mysterious Mariah with the wrist tattoo, has been stalking Tyler and Abby. I also hope that Carmine is not alive. I'm relieved that the "Remember Me" cake that was delivered to the Baldwin residence was probably from Womack and was intended for Fen. Please! Not another cancer stoyline. Make Lily cancer free. 6. The writers need to speed up the pace on some of those storylines. For example, please hurry up with the mystery of Jill's music box! They should also speed up the storyline about Lily and Cane's search for a meaningful project to work on. 7. It's been obvious for some time now that Sharon and Nick are going to get together again. It's too bad that their renewed relationship has been doomed from the start. We viewers know it will be over once Nick finds out what Sharon did. Also, the writers have ruined Sharon's character and made her so manipulative that it's difficult to care about her and Nick reconnecting. 8. Did you watch the classic New Year's episode? Nick and Sharon looked so fresh and young. Whatever happened to the Colonnade Room.? I guess it was closed it down because they don't show it anymore. Talk about posh! That place was so upscale and elegant that very few people in Gnoa City, aside from the Newmans, Abbotts and Mrs. Chancellor, could afford to dine there often. 9. Jack Abbott has come up with some great nicknames for Victor - "The Moustache" (although he doesn't have much of a moustache anymore), "Mr. Mumbles," "The Black Knight,"and "Moneybags." Yet, for some reason, I don't like his nickname for Phyllis, which is "Red." CC from Etobicoke, Ontariio has written her thoughts on Michael Muhney's firing. Here is CC's take on the matter. Michael M.'s firing is putting a bad taste in everyone's mouth which they may not be able to get rid of even if millions write in. It won't feel good again no matter who the actor is. I think some reasons for this dismissal may be the result of Eric B. (Braeden) picking up on the fact that fans are liking a younger, more talented, more likeable version of an evil Victor type character. Victor has been becoming more and more despicable lately, very curmudgeonly just as men often can become in real life. The acting quality is just not there, not that it ever was. Last week's posts also quoted Michael M. as saying he and Eric have had their differences. It wouldn't be a surprise to learn that Eric exacted his revenge on Michael M. by manipulating the powers that be to get rid of him. Unfortunately it sounds like Michael's inexperience in dealing with fellow actors and execs when he has achieved such success in a role as he has as Adam on Y & R may have have helped do him in. When all that is coupled with everything that has $$$ attached it is no surprise things have gone this way. I agree with Joanne that the fans will suffer for a long while as Sony and CBS learn their lesson the hard way. Can The Y & R survive this ridiculous move? Is sabotage by (executive producer ) Jill Farren Phelps in play as fans and press have alluded to by comparing her Y & R decisions with those made when she was at the helm of other soaps which are no longer around? Another fan, Tina from New Jersey, predicts a relationship between Gloria and Alex Chavez, the much-younger Hispanic cop. I wouldn't bet on that, Tina. Gloria only appears from time to time. She is on contract and Alex is heavily involved in other storylines. Yes, they were in a light scene together with Kevin and it was a bit of a comic relief. If, however, your prediction comes true, I promise to give you credit right here in this space. Here are some further comments courtesy of CC from Etobicoke. Thanks for your input, CC. Although I had never seen or heard of her before, the actress who plays Kelly (Cynthia Watros) has played an evil character on other soaps. Both Neil's character and actor have overstayed their stay in Genoa City as far as I am concerned. Actually the whole family branch should move away ....perhaps Cane should take them all to Australia! I guess these storylines will all be coming to a head in time for the February sweeps. The writers will really need to pick it up to make things interesting seeing as Billy and Adam actors are going. Worst 3 events of 2013...Delia's death (totally unnecessary; they could have done the whole organ donor thing in a better way); Adam's possible involvement (I'm still not convinced he did it); and anything to do with Billy causing the change of actor. They really need to make a decision about the whole Phyllis thing because Jack is out there twisting in the wind with nothing to do except watch his son bring him down in his ongoing feud with Victor. I've lost track of who is owning and running Newman, Chancellor, Jabot? That whole storyline is mess. One thing for sure, the show needs some streamlining to keep it going. Writers should focus on the 3 or 4 key storylines and get rid of the fluff that they keep trying to use to introduce new characters and plotlines. How do you like Eileen Davidson's shorter hairstyle? I'm getting used to it. It's starting to grow on me (ha ha). Robert Adamson (Noah Newman) is going to be a father. He and actress Linsey Godfrey, who portrays Caroline Spencer on The Bold and the Beautiful, are expecting a child. Adamson announced the news on Facebook. It's a good thing his character Noah isn't the one who's going to be a father. His television parents, Joshua Morrow (Nick Newman) and Sharon Case (Sharon Newman) look much too young to be grandparents. There has been so much discussion on Y&R about cult leader Ian Ward, the man who manipulated a young Nikki and fathered Dylan McAvoy. It was only a matter of time that his character showed up. It has been confirmed that Ray Wise, who starred as Leland Palmer in Twin Peaks, will appear in the recurring role. That's all for now. Why not participate in my Reader's Poll below. Please note that the next Y&R Report will appear on Saturday, January 18, 2014. What was Y&R's worst mistake of 2013?